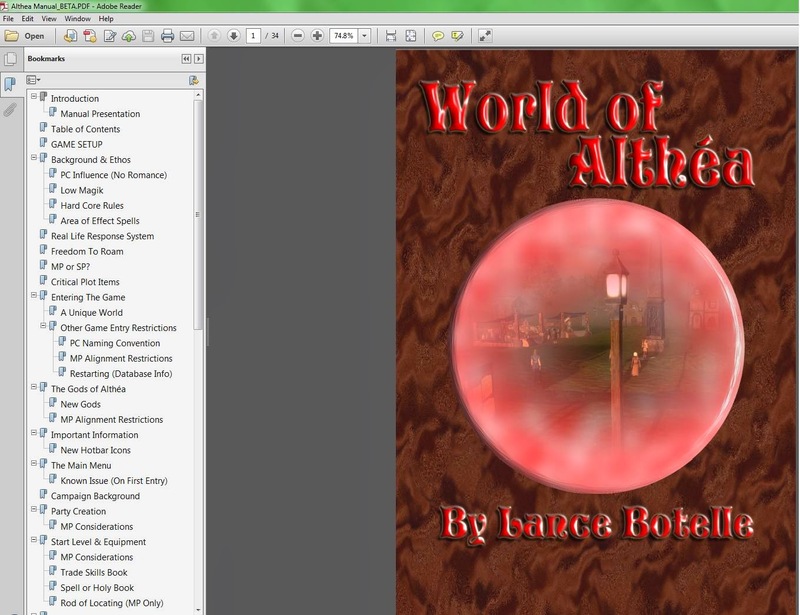 The World of Althéa: Althéa Manual Goes BETA! Don't go getting too excited ... I did say the "MANUAL". However, this is a reasonably good sign that I am relatively confident that the campaign systems to be released with the first module are now in place and stable. I decided to release the manual now (as a BETA for anyone interested) so that players can make comments about anything they read, be it questions on any systems, comments to make things clearer, or simply to be able to provide initial feedback on any presentation. Also, for those who have followed my blog, to let me know if they feel I should have covered anything else in the manual that they recall reading from the blog. The Althéa Manual Goes BETA! There may be some areas I still need to cover in the manual, but will leave that to any BETA testers of the module itself to comment on. After all, the testers will be in the best position to comment after having access to both. As far as the module itself is concerned, I have just started my first play through to polish any of the first areas and general code at the start. All is going relatively smoothly at the moment, but I know there are some later areas that still need a degree of work to finish before a final test. However, if the first few areas go well, then I will most likely release this for BETA testing after updating the final areas that need doing without replaying the whole thing myself. 1) Added last of the area music. 2) Completed adding Load screens. 5) Added some LORE entries. 1) About 3 areas, with related content and code. 2) Finish updating the Bestiary for this module. 3) Finish adding any LORE that may be required. 4) A few related journal entries still need finishing.